and I was wondering! nice. What is the book to the right of Edgar Allen Poe? Nice looking cover but I can't read the title. I've been a comic book fan for a long time, but I never read Doom Patrol. It's one of those "get around to it" titles for me. Any suggestions where I should start? I have inter-library loan and I'm not afraid to use it! Those Nightshade Press collections of Smith are fantastic. Not cheap but worth it. 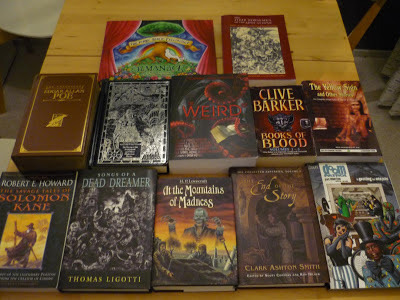 The one next to Poe is a Nightshade edition of William Hope Hodgson. Morrison's entire run on Doom Patrol is available in trade paperback, I'd just get the whole set (there are six of them). Read them in order though, that's important. I really have to some day take a look at your Monolith adventure because Hodgson influence would certainly explain things I have read on the reviews. Which version of At the Mountains of Madness is that, don't think I've ever seen that cover? Thtat must have been a pretty penny. Where do you normally buy your book books? It seems Amazon is very lacking in the more unique ones and eBay seems horribly expensive most times. Amazon UK, a local bookstore, or direct from the publisher. Those Ligotti books cost me about 45€/$60 each when factoring in shipping. Nice spread! A particular kudos to you for the Ligotti book! Im pretty sure he's still not very well known by even some genre fans. I have a cool collection of his stuff called The Nightmare Factory. I need to reread that soon.